If by the end of 2017, the Penny Market chain had 221 stores, the retailer ended 2018 with 236 locations and plans to continue this expansion with 20-25 Future Stores this year. "2018 was very good for us. We continued our company's strategy and reached more cities in Romania, which means we are closer to our customers. We will continue our expansion plan in the years to come and we will develop our business here so that in 2025 we will reach 400 stores", said Daniel Gross, General Manager of Penny Market Romania. In December, eight Penny Market stores were opened in Ramnicu Valcea, Bucharest (2), Chiajna, Sighetu Marmatiei, Lehliu, Curtici and Horezu. "We have big plans for further development and we want to expand our chain of stores. 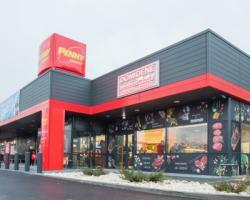 In 2019, we will continue local expansion with a number of 20 to 25 Future Store stores", said Penny Market representatives. The entire chain is served by 3 logistics centers located in Stefanestii de Jos, Turda and Bacau. At present, Rewe Romania has 236 Penny Market stores nationwide and employs more than 4,300 people. In 2017, the German retailer reported local business of 2.99 billion lei, 1.04% more than in 2016, and a net profit of 19.1 million lei, according to data provided by the Ministry of Finance.